Is that individuals represent their country and respect the practice of sport through competition. Remarkable Olympians are held up as exemplars of both the culture of the sport and of the nation they represent. Crossing the boundaries of one or the other can produce curiosity (the Jamaican bobsled team) and controversy (the cross-country team representing Dominica in 2014). Back in 2014, some noise was made about a couple representing the Caribbean island nation of Dominica in cross-country skiing, in part because they had no native ties. Some may have felt they gamed a system based on competition between nations. Others probably dismissed as having disrespect for the Olympic ideal. In the 2018 Olympics, being from somewhere else is beyond being a curiosity. Transnational marriage, immigration, and displacement are having an impact on the native origins of athletes. In the cross-country ski events along, we have several ‘multinational individuals’, people who have citizenship of the countries they represent, yet spent much of their lives elsewhere. In some cases, they might not be competing had they been raised in their country of birth. You don’t have to be a nativist to wonder what it will mean to be from somewhere in the future. At the same time, occurrences like these help surface a form of conditional acceptance on a world stage. Overall I think the stories behind people coming from an unusual place are good for the sport and it refreshes my perspective. This is an easy one- first, Magnus Kim is a really good, really young ski racer. Second, he’s competing for the host nation of South Korea. Kim has Korean citizenship by way of his mother and apparently spent a lot of time skiing in Norway, his father’s country of birth. Read more in a press release by Yonhap News Agency. Next, Karen and Mark Chanloung, who hold dual Italian and Thai citizenship, and will compete for Thailand in these Olympics. Then there’s Tongan Pita Taufatofua. Born in Australia and raised in Tonga, he shifted sports to learn cross-country skiing. He’s obviously had an adventure in the switch. 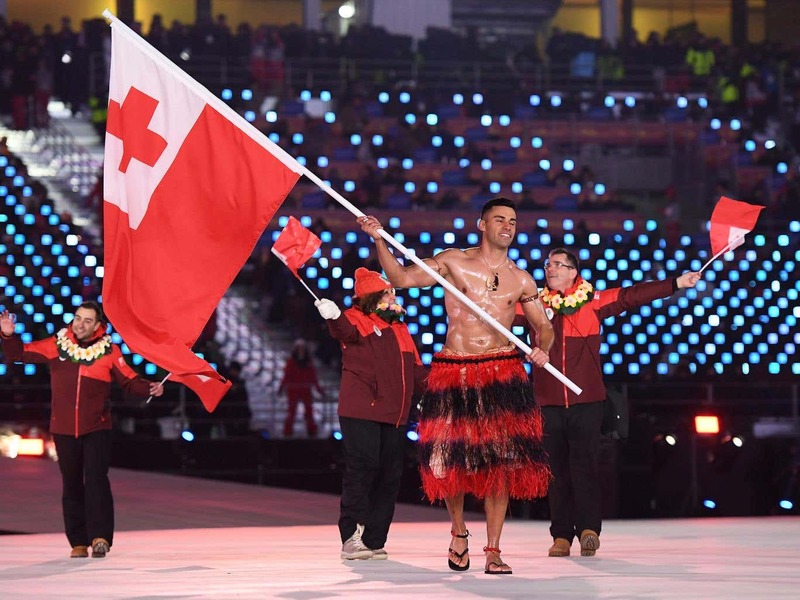 His opening ceremony outfit was, well beefcake. And there’s the lone cross-country ski competitor for a sub-Saharan African nation, Mathilde-Amivi Pettijean. Pettijean was raised in France but represents her native Togo. Growing up in a small city with a view of Mont Blanc explains her lifelong familiarity with snow. For more there’s a short Q & A in the Fasterskier website. The prize for global ski citizen goes to Kequyen Lam, who represents Portugal by way of Vietnam, Macao, and Canada. His grandparents came to Vietnam from China but his family became displaced and broken up by the Indochina wars and their aftermath. Kequyen was born in Macao while it was a colony of Portugal (which I presume allowed him to claim Portuguese citizenship) and then raised in Canada by his grandparents who had settled there after leaving Vietnam. Here’s a profile of Kequyen Lam, also from Fasterskier. Outside the spotlight of the ‘human drama of athletic competition’ at the Olympics are athletes without an interesting origin story to make them noticeable. So far outside the spotlight are they that most of us may not even know their countries are represented. Not so long ago, that was the case for the US in the cross-country ski events. To get better, you just have to start somewhere with someone. So, with apologies to the parts of Europe where cross-country skiing is more popular or at least better-known, here’s to the ones at the back of the pack. Below is a list of lesser-known skiing nations and their Olympic cross-country skiing athletes for 2018. The chances for any of them to win a medal (Magnus Kim a possible exception) are effectively zero, but I salute them for going all-in despite the odds.